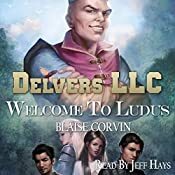 Excellent AudioBook – Well worth a listen, especially if you’re fond of the LitRPG genre. This happened to be my first, it won’t be my last. When you like a narrator you do tend to find books and genre’s you’ve never listened to before, so this was a first for me. I did used to game a lot when I was younger but I’m a bit out of touch now. I hadn’t known what to expect from the plot, and I hoped that it would entertain, yes it did. There were some really great points and then some low ones. I did find that although the Mc’s were almost 30 and older, that their mindsets were that of much younger guys, for me in their 20’s either that or their teenage male hormones just kick in at stupid times and especially around the women of the planet. I would like to think guys a little more mature didn’t act like these two in some situations. Their reactions in most situations are quite normal, even if they’re accepting to their new situation a little too easy, but as explained theres reasons for that. In relation to the two ‘ladies’ they come across, I think that both of them ending up in a relationship with the two Mc’s is a little too good to be true and feels a little more like hero worship and entrapment of some kind, at least to me. Of course, I can’t fault the performance, Jeff really brings the best to the table and he’s always going to make something amazing. As an audiobook I listened til just before Chapter 15 before I the writing actually pulled me out the story. As I’m new to the genre, I’m not 100% sure on how switching POV’s so late in the story is acceptable, but I guess it is. Marine’s pov here didn’t do anything for me, and I have to be honest. As a script writer and juggler of multiple POV’s they’re important for me to be early on in a story. I can only think that and the same goes for the other POV’s that sneak in now and then. There were two pretty important big battles in here, and the most important for me is the fight against Thod obviously, and this is a really great scene. Almost wanted the book to end soon after, I honestly am not sure that the dungeon scene later measures up to it. Overall, I had some fun, laughed and routed for the Mc’s in their quest. I know I’m not quite the target market, and that shows in the way I perceived some of the plot points. I do think this is a good book and that people of all generations and those who love both Fantasy, Scifi and this newer genre will enjoy.